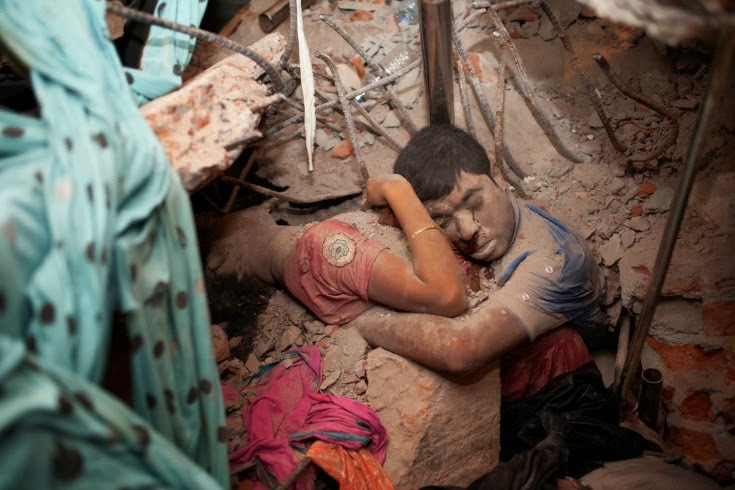 TIME MAGAZINE has once again published their Top 10 Pictures of the year. The 2013 selection does not fail when it comes to capturing what words alone cannot describe. How better to come back from a few months blogging hiatus, than to share these awesome images and heart tugging moments, along with commentary from the photographers themselves. 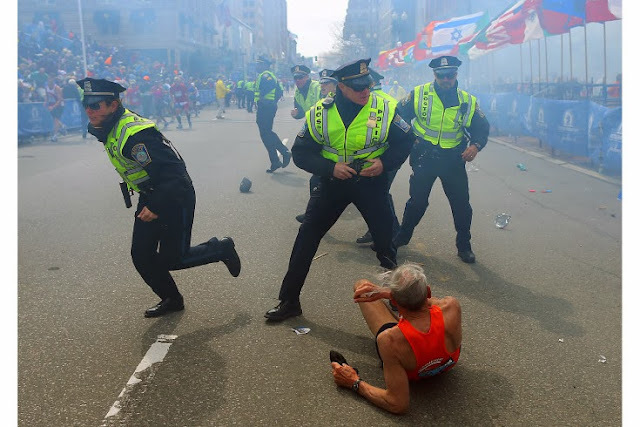 The bomb exploded about two hours and forty minutes after the winner of the men’s race had crossed the finish line on Boylston Street. I was standing on the finish line photographing runners; some dressed in costumes, others were holding the hands of children and family members as they shared the joy of finishing together. The scale of the protests took me by surprise. 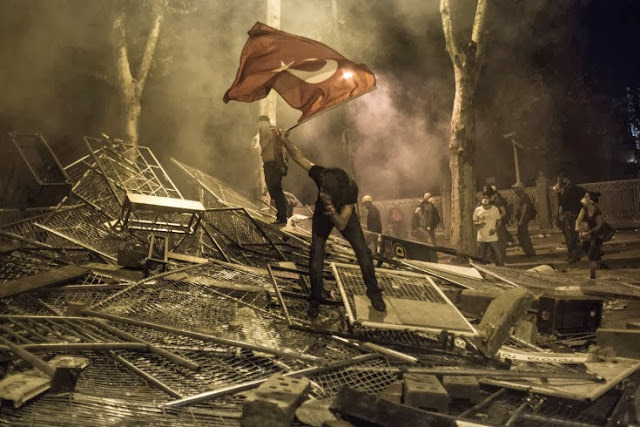 Living near Istanbul's Taksim Square, I am used to seeing demonstrations. The Gezi Park Protest seemed nothing exceptional at first. So I left Turkey for a story in the Ukraine. But as I was traveling, the movement to save Gezi Park turned into protests against the rule of Prime Minister Erdogan. I decided to fly back. The following night, I photographed youths clashing with police near the Prime Minister's office in Dolmabahce Palace. The protesters pushed towards his office and the police fought back with water cannons and enormous amounts of tear gas. To make it harder for the police to advance, the protesters built barracks out of everything they could find. On one of the barricades I saw this guy waving the Turkish flag, collapsing from the tear gas and retreating when it was too much too take. Even though I wore a gas mask, I had problems breathing. He did that a few times without any protection. I followed him for a while and took this frame. The photo went viral within minutes after I posted it on Facebook and a Turkish friend shared it. Within hours 10,000 people posted it, made it their profile picture and appropriated it. It appeared on t-shirts and posters and, oddly, was turned into a monument in Turkey's third biggest city, Izmir. I took this picture of Bobby Henline at a Motel 6 a few miles away from the Houston airport. Earlier that day he'd met the father of Rodney McCandless, a 19-year-old who died in the same humvee explosion in Iraq that injured him. It was sweltering. The pool was lit by a soft glow. 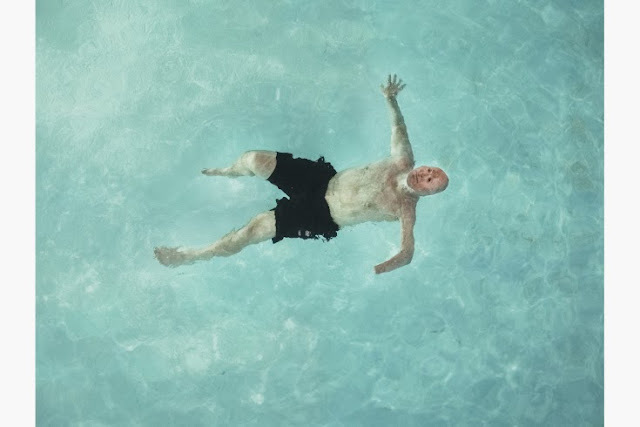 Bobby got in the water and floated on his back into the light. From the balcony, I hammered at the motor drive of my camera. Every little movement he made seemed significant. A few people staying in the motel drifted to the balcony to drink beer and watch silently. Bobby didn't mind the attention. By becoming a standup comedian, he's taken ownership of his injuries. The desk clerk came out and said she had to lock the gate to the pool at 9. Bobby and I protested that we needed a bit longer to get the picture perfect, but she wasn't interested in being flexible with the rules. A soft rain started falling. We finished up and headed out for a beer. Mosa'ab Elshamy. Cairo, Egypt. July 27, 2013. I rushed to Rabaa Adaweya square shortly after midnight on July 27th after hearing that security forces were attacking Morsi supporters who had been camped there for two months. Throughout the night I would alternate between the front-line, the makeshift hospital and a room where dead were kept, documenting a level of brute violence and horror I hadn't witnessed until that night. There was a constant stream of ambulances and motorbikes in the camp. The sound of sirens and panicked shouts mixed with that of live ammunition, and the air was filled with tear gas and black smoke. Twelve hours later, I put the camera away as I got exhausted and headed back home. On my way out I heard screams and noticed a large group of people. Two men carried a dead young man who had very recently been shot in the head. The man (on the right) was in a state of shock. 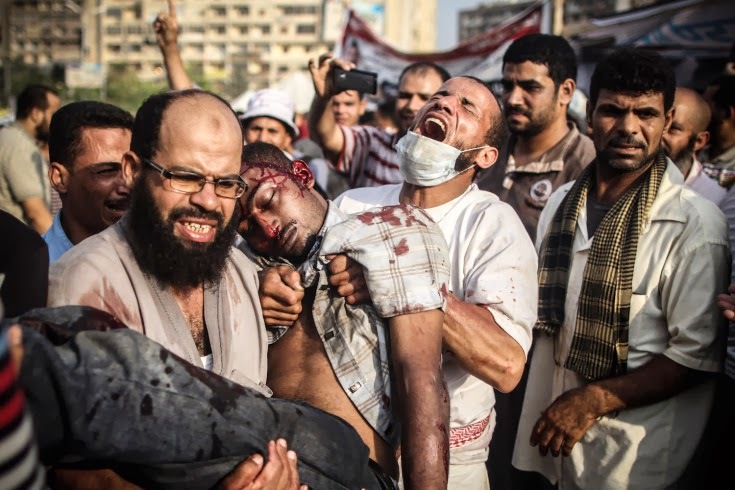 Unaware that the man he carried was dead, he pleaded for a medic or an ambulance and screamed for God's mercy. I quickly got the camera out and took this photo. It was the last picture I took on that horrific day, but it remains the most memorable. It’s very stormy at this time of year in the Philippines. Clouds gathered in front of the setting sun while along the road residents lit fires to burn the debris left by the typhoon. Momentarily, the devastated landscape took on a strange beauty, and it was just then that this group of women and children appeared on the road. 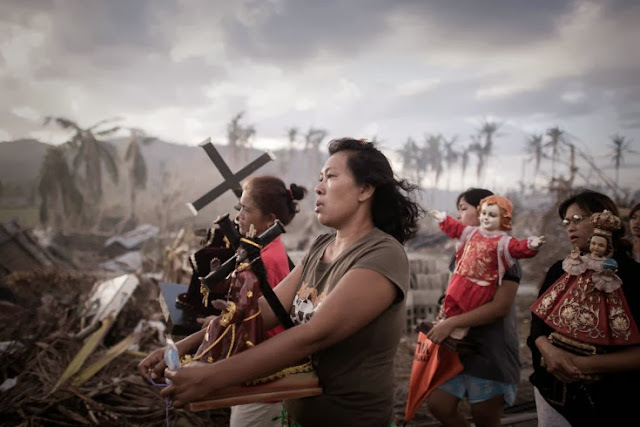 I think people gravitate towards this picture not only because it is visually strong and emotional, but also because, in a way, it draws on some viewers' own faith. On the January 4, 2013, a bush fire swept through our small coastal township of Dunalley in Southern Tasmania. 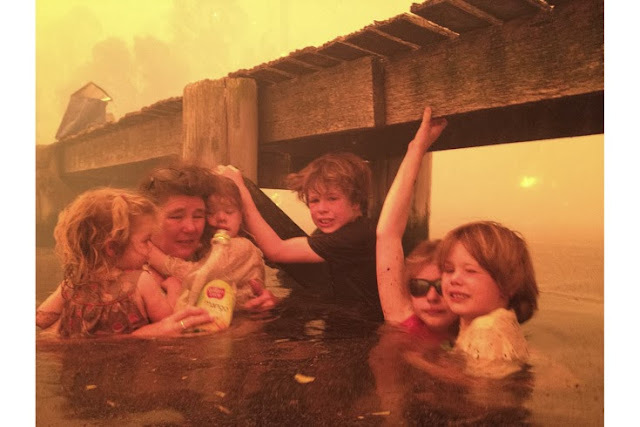 My wife and I and our five grandchildren took refuge in the sea bordering our property as massive columns of fire consumed everything in their path. The grand children had lived next door to us in a beautiful, sun-filled timber farmhouse. It had a picket-fenced garden strewn with children’s toys, sandpits and colorful flowers. There was a pathway that ran through the trees to an old wooden boatshed and jetty where the children would often play. On that day the jetty became our shelter, the water was cold and the fire was intensely hot on our faces but the biggest problem was the lack of air to breathe. We found a shallow area of breathable air between the toxic smoke and the water. The fire burned right down to the water’s edge and the jetty itself caught on fire, but we were able to put it out. We spent two and half hours under the jetty and I took the photograph with my wife’s iPhone to send by text message to our daughter so that she could see that we were all together. Our lives were spared but houses and all possessions were lost. I took this picture on August 31 in Keferghan, a town near Aleppo, in northern Syria. 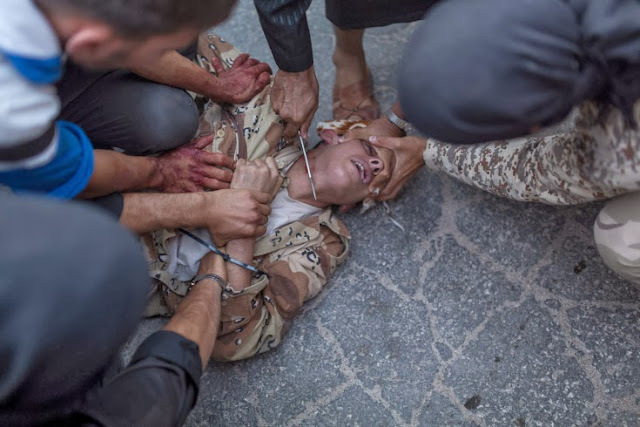 It was the fourth and last execution of the day committed by Al Qaeda-linked ISIS militias. There were people of the village with their children, observing the scene in silence. A man, covered with black clothes except for his eyes, read his crimes for a long time. After the execution in Ehtemlat, the body was put on a pick-up and was taken to another village. The next was the execution in A'zaz, and the scene was repeated once again. The bodies were being taken from village to village. There was another execution right after A'zaz, and then Savran, and then Keferghan. All the people who witnessed the executions seemed relieved. I was not even sure of what kind of a picture I was taking. I tried hard not to put my camera down. I only tried to record the events through my camera. I had to document what I saw, one way or another. This is a war, and I was in the middle of an unbearable moment. It was clear that something catastrophic was developing when I arrived at Nairobi’s upscale Westgate Mall. Gunfire had been reported, and I witnessed hundreds of victims streaming out of the building, many of them shot and bloodied. I realized this was the attack people had warned about since I moved here two years ago. Al Shabab militants were waging a violent attack on a crowded target frequented by foreigners. After photographing the panic outside, I turned my focus to finding an approach into the mall, where I found a small number of disorganized Kenyan police and army, mixed with terrified masses trying to escape the attackers. From an upper floor I moved to the balcony of the atrium to glimpse the bloodshed below. 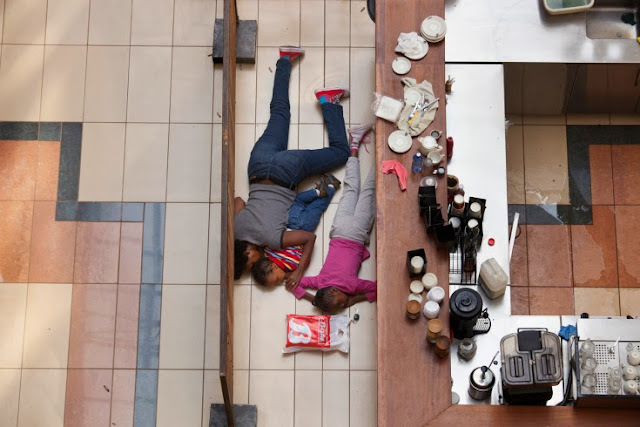 Bodies of victims lay lifeless where they fell, and among them a terrified woman remained stranded with two children in a café. They remained there, petrified, with quiet, everyday music continuing to play over the mall’s sound system. I took some photographs and then retreated from the exposed position. The woman and children were later rescued unharmed. Add David Jenkins. Seal Island, South Africa. July 26, 2013. I have been traveling to Seal Island off the coast of South Africa for 5 or 6 years now to photograph the interaction between the great white sharks and their prey, the cape fur seal. On the morning of July 26, 2013, I made my way out to Seal Island with a local shark tour operator. The sea was not too rough and there was some cloud cover -- good conditions to see the sharks hunting. Usually, the most active hunting time is an hour before sunrise and an hour after. I arrived at the island at about 7:15 and immediately we could see that there had been some kills -- from the gulls in the area hovering and the slicks on the water. When the attacks happen they are at lightening speed and can be over in a second. We decided to track alongside some seals which were coming back to the island after feeding out at sea, keeping a distance so as not to interfere. I noticed a smaller seal had dropped off the back of the main group. The sharks often choose the single seals to attack as their chance of success is higher. I tracked with the seal in my viewfinder and, without warning, a great white attacked. 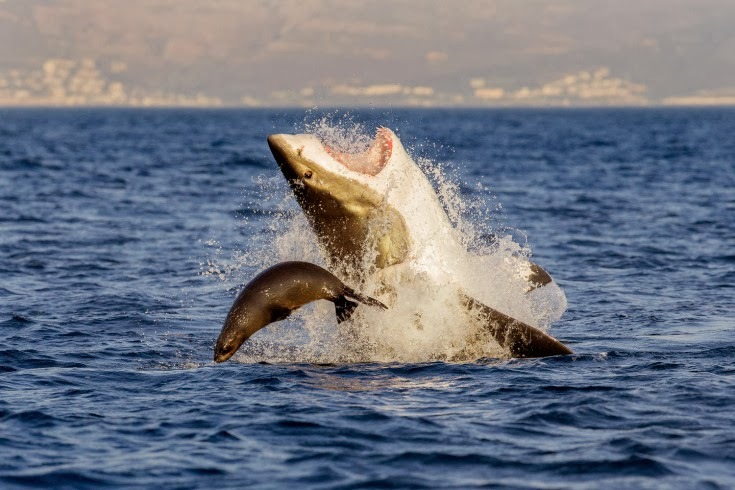 The shark had its mouth wide open and the seal managed to just avoid the bite. It was sent flying out of the water by the nose of the shark. As the seal was falling back towards the water it narrowly missed the mouth of the shark. For the next couple of minutes the seal stayed close to the shark's body but away from the mouth, using its agility to tire out the shark. When the shark gave up, the seal managed to make its way back to the island safely. Add Taslima Akhter. Savar Dhaka, Bangladesh. April 24, 2013. Around 2 AM among the many dead bodies inside the collapse, I found a couple at the back of the building, embracing each other in the rubble. The lower parts of their bodies were stuck under the concrete. A drop of blood from the man’s eye ran like a tear. Since then, this couple remains firmly in my heart. So many questions rose in my mind. What were they thinking at the last moment of their lives? Did they remember their family members? Did they to try to save themselves?